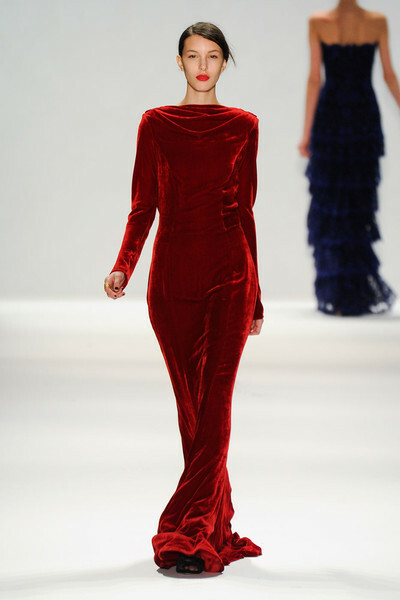 Red is one of my favorite colors and I’m pleased to see that designers used it in their Fall/Winter collections. I’m usually drawn to deep scarlet red generally but sometimes tomato red is a nice burst of color. 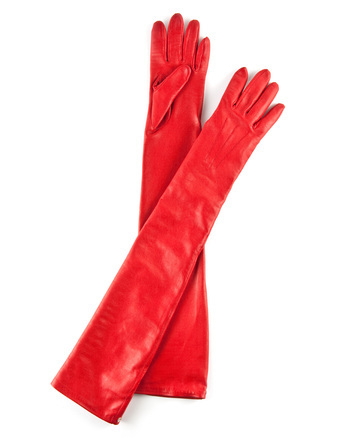 I’d love to have an occasion to wear long red leather gloves. These are a beautiful color – I think they’d look great with a black gown. 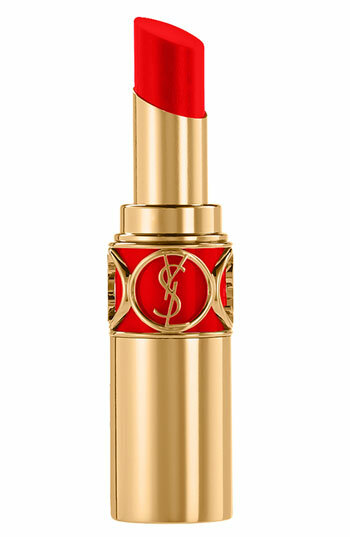 For a real life splurge, a red lipstick might have to do. I like the way this color looks in the photos but I’m afraid it’d turn fuschia on me. Early 20th century velvet with golden pile © Managed by The Textiles Collection at the University for the Creative Arts at Farnham. Photo from Visual Arts Data Service. Velvet is such a lovely, sensuous fabric, particularly when it’s silk. The sheen and texture show off deep colors so richly. Burnout velvet is beautiful – I’d love to have a silk velvet burnout gown someday. (Fashionistas – is “burnout” the correct term?) 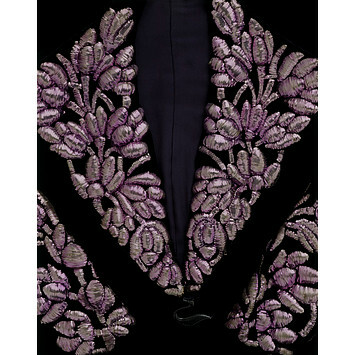 I also like embroidered velvet; the lapel on the Schiaparelli jacket is wonderfully crafted. Schiaperelli embroidered velvet jacket. Photo courtesy Victoria and Albert Museum. 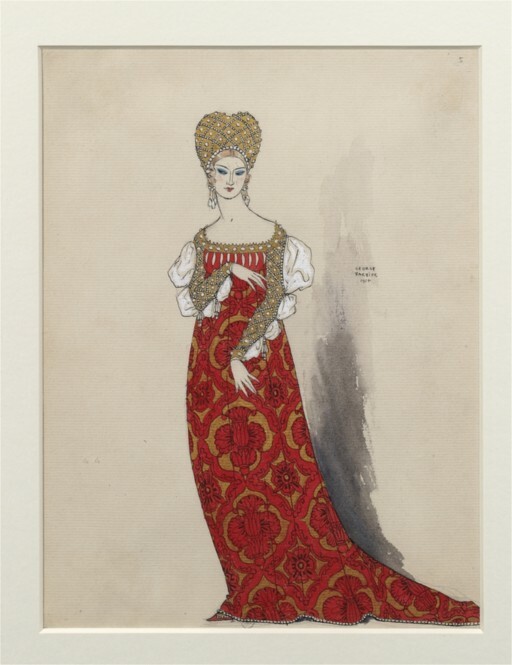 My first velvet item of clothing was a velvet jumper (dress) that I wore over a white blouse. I’m pretty sure my grandmother gave it to me for Christmas when I was still in elementary school. These days, I have a pair of black velvet pants to wear to holiday parties – depending on the occasion, I wear a simple black cashmere sweater with one of my vintage brooches, or with a satin blouse and heels. 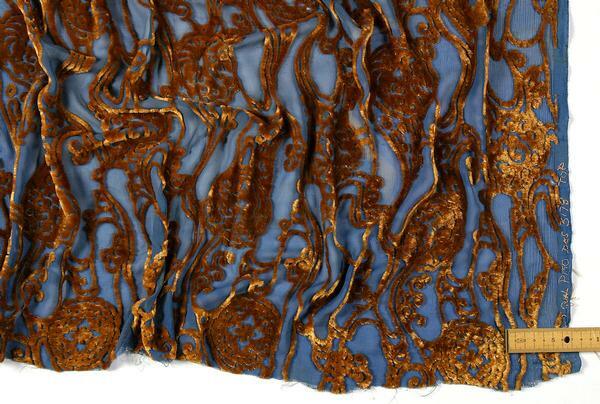 For Fall 2012, a number of designers used opulent fabrics in their collections; If you like luxe and opulence, see my friend Catherine’s post on trends. Velvet is my favorite luxury fabric, and I think it’s the perfect fall/winter fabric. 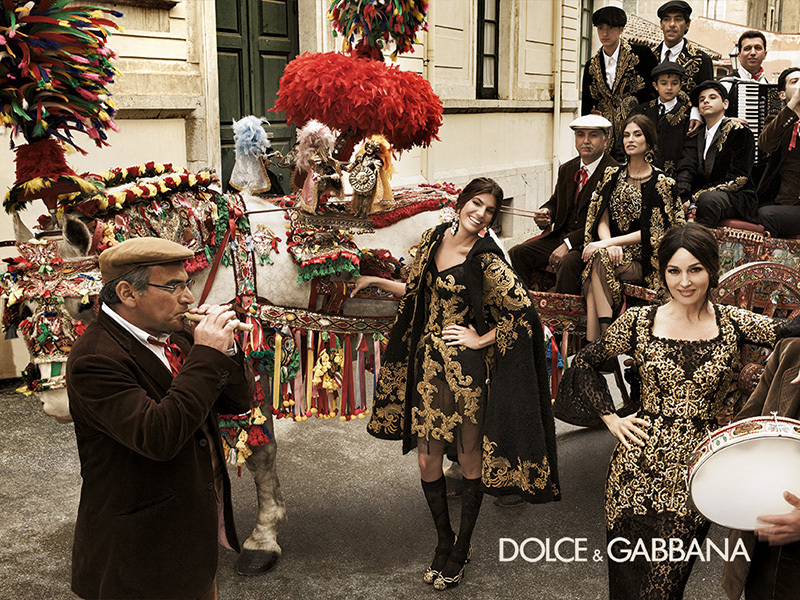 Dolce & Gabbana’s black velvet embellished with gold is both elegant and fun. I wasn’t familiar with Tadashi Shoji – I think his designs are beautifully feminine and luxurious – the drape of the red gown and the back decorated with lace is wonderful. Tadashi Shoji gown. Photo from StyleBistro. 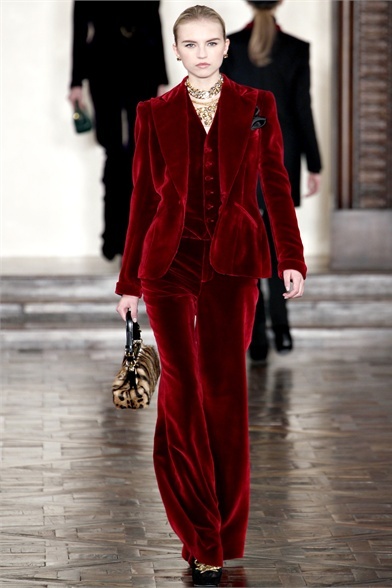 Ralph Lauren’s velvet three piece suit caught my eye. I can imagine wearing it with black patent leather derbies or velvet tuxedo slippers. 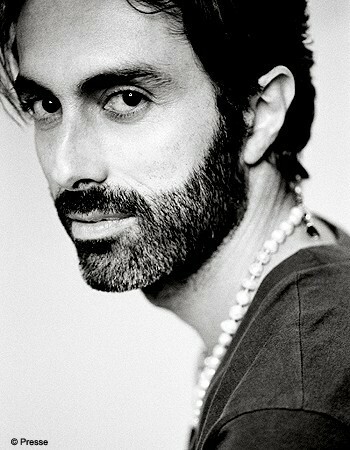 I have a soft spot for Italian men, and Giambattista Valli epitomizes why I find myself attracted to them. Sure, he’s handsome, speaks Italian, French and English, and loves books, but his website tells us more. He’s obsessed with Fellini’s films and costume drawings, and the first thing he lists in his chronology is Visconti’s movie, Il Gatopardo (The Leopard), specifically Claude Cardinale’s laughter. How could I not be smitten? But I digress. Giambattista Valli created a visually stunning collection that I appreciate for its artistry, creativity, and beauty. 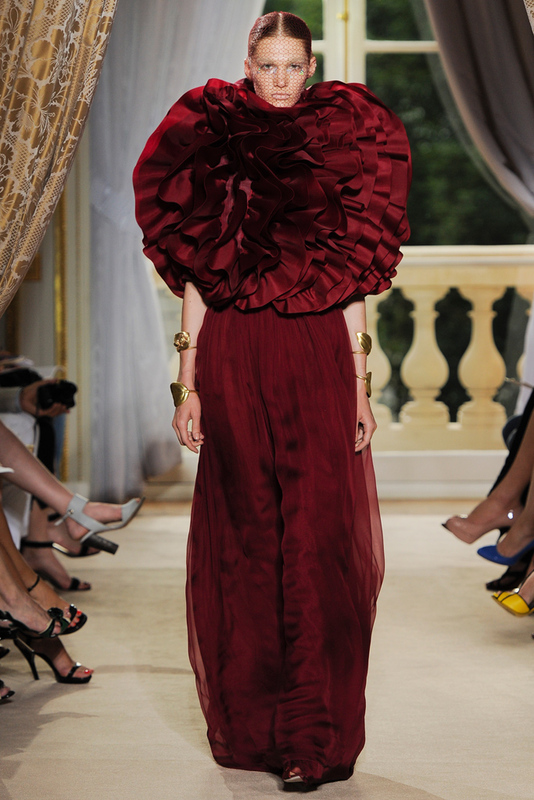 The first gown shown below is stunning – the scarlet color is deeply hued and the top reminds me of a dahlia in bloom. 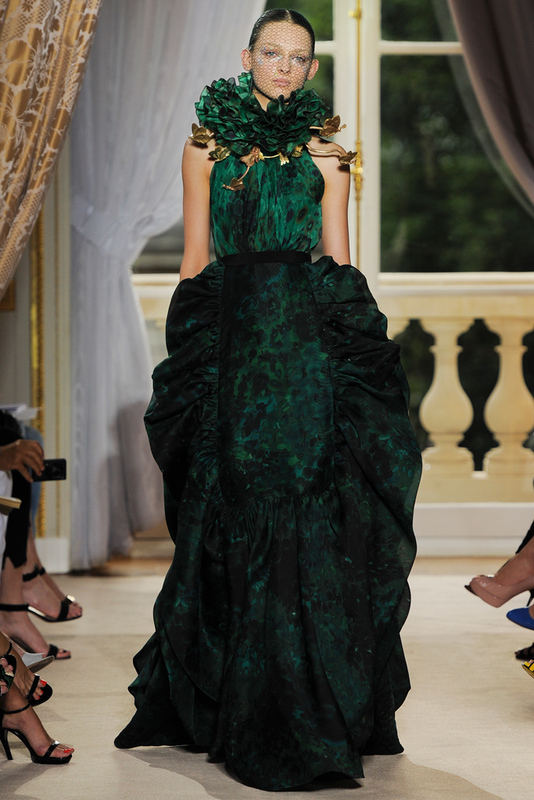 The green gown looks so original its collar reminiscent of flower petals sewn together with a muted, textured print. Stunning. The black outfit is interesting – it’s the best version of a carwash skirt I’ve seen in years and I like the warm, homey looking sweater with it; it’s a fun juxtaposition. 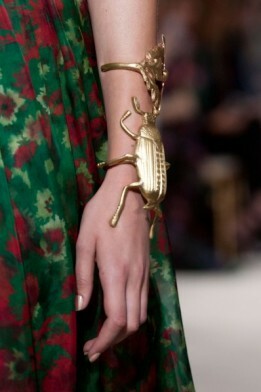 The last photo is a wonderful gold scarab cuff crafted by Valli’s partner and collaborator, Luigi Scialanga. I think it’d go nicely with most everything I own.